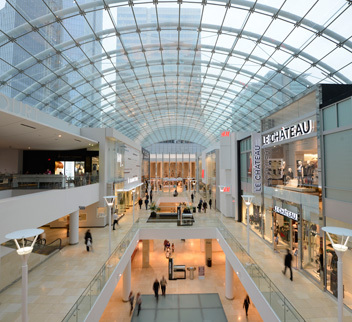 The CORE, Calgary’s only downtown shopping centre, offers over 566,000 sq ft of premier retail shopping and is comprised of the Calgary Eaton Centre, TD Square and 516-8th Avenue. The CORE Shopping Centre is proud to have been awarded a LEED Gold for Commercial Interiors (CI) certification, making it the first Regional Shopping Centre in the province of Alberta to attain a LEED CI Gold accreditation from the Canadian Green Building Council (CaGBC). This certification comes after an extensive renovation; which ultimately saw all common areas being recognized as LEED CI Certified in 2014. The CORE has embarked on attaining a LEED for Existing Building (EBOM) designation for the CORE portfolio. The project is currently registered under LEED EB (O+M)-2009, which will potentially see the complex, inclusive of approximately 1,400,000 sq ft of office towers, attain a LEED EBOM Gold certification. TAG environmental monitoring system, which enables the centre to achieve 100% in BOMA’s environmental scoring. New skylights allow natural light throughout the centre and an automated, energy efficient LED lighting system allows for daylight harvesting. 3,017 Green Wall consisting of nearly 40,000 philodendron plants. The plants' natural filtering system provides shoppers with as much clean air as 30 14-foot trees. State of the art cast iron sectional boilers which boast high-efficiency performance, resulting in reduced utility consumption. State of the art cooling tower installations, completed in 2014, have lead to decreased water consumption. Purchase of 15,047 MWh’s of Renewable Energy Credits, which supports clean, renewable energy. Enhanced building Retro-Commissioning to take place in late 2015. Site to identify both operational and capital measures to further boost the site’s overall performance.